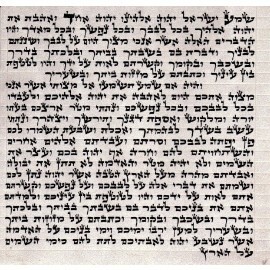 This handwritten 7 x 6.5-centimeter / 2.7x 2.5-inch Mezuzah Scroll / Parchment is handwritten by a qualified sofer (scribe) according to Jewish law, with some letters beautifully adorned. Comes in clear plastic cover (9x10 cm/3.5x 3.7inches) to protect your parchment, as according to halakhic law. Recommended with your mezuzah purchased at Judaica Mall.